the inscription on the entrance sign to the Blue Mosque in Istanbul is a perfect quote for Turkey. The people are inviting, the country magical, and there is something for everyone. Just landed into Turkey a couple days ago, and I was way to gluttened for choice. From the Ottoman mysticism of Istanbul, to the ancient Greek ruins of Troy and Ephesus, to the stunning Mediterranean beaches, or to the sky-reaching peaks and caves of Cappadocia – man, you can be enthralled for months in Turkey! There is no way to experience the country in just a 10-day trip…. but I’m gonna try! Being the busy-body-type, I opted for backpacking through a couple historical towns located in the interior and Istanbul – I had to leave the beaches of Antalya and steppes of Pamukkale for another day. Reaching Istanbul from London is not difficult – there are a lot of options including budget airlines. I actually ended up taking a British Airways flight. The only annoying thing is the Visa line when you land in Istanbul – especially if you are Canadian. For some reason, everyone but Canadians pay between $20-$25 for their Visas, but Canadians have to pay $60! And they only take US dollars. I had Turkish Lira which they convert to US dollars at an astronomical rate, so I ended up paying more like $70… I guess Canada ticked Turkey off at some point… Anyway after the getting the visa, I immediately hoped on a Turkish Airlines flight to Konya –The city of Rumi – the world’s greatest poet (and who’s works are amongst the top purchased poetry in the US now). Konya is where he lived before passing away and where his mausoleum is, making it considered the most religious city in Turkey – but that’s like saying Quebec City is the most religious city in Canada. Being my first stop in Turkey, I’m suprised at how European Konya feels. Completely developed with no infrastructure issues (running water, smooth roads, no drainage or garbage issue – and yeah i know I was a victim of stereotype images… ), shops filled with all the junk food you’d expect back home, and some of the most helpful people anywhere (English is not a problem)! Walking about, I right away noticed the vibrant music and café culture. The serenity of the Sufi way of life seems to permeate the entire city as well and makes for an amazing introduction to Turkish life. You don’t come to Konya to party – you come to Konya to relax, soak in the sun, enjoy pide (Turkish Pizza), Dondurma (Turkish Ice Cream), and Turkish Tea. You can order Turkish coffee, but locals have been quick to point out that no real Turk would drink the stuff. Tea is the drink of choice. Its a great follow up to a morning tour to the Mevlana Muzesi – the final resting place of Rumi’s body. Everything in Konya is pretty much within walking distance, so you can choose when to head to the Museum. Getting to the Muzesi later in the day has it’s pros and cons – con: far too many people. Pro: they aren’t typical tourists. Generally, people visiting the Musee are making a pilgrimage and so the normal chaos associated with some sites is not there, and rather people are spending time to say a silent prayer and take in the majesty of the shrine. 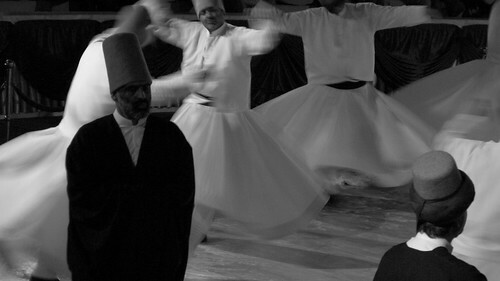 On Saturday nights, there is a free Sema – a performance of the whirling Dervishes (Sufis), and unlike the Sema performances you’ll see elsewhere, this one has an air of authenticity to it, within an amazing venue, and has over 30 dervishes and an accompanying music group. Sitting there watching the dervishes spinning, with the soothing sound of the turkish lute, you can’t help but feel like you’re falling into a transe too. It felt like I meditated for the whole hour and not wanting to ruin the chilled out state I was in, I walked the 2km back to my hotel rather than take a taxi. I wish I had planned this better though – if I had shown up a day earlier (on Thursday) I could’ve attended one of the underground tekkes (where sufi ceremonies take place), or just arrived on Sat morning and wandered the streets until the Sema. I arrived on the Friday, and unless you want to just chill out, the extra day wasn’t really needed. Anyway tomorrow morning, I’ll be ready to hop on a bus to Cappodocia. « Help Me with my Resolutions!